The Best Performing Penetrating Sealer WATER, STAIN & SLIP PROTECTION FOR: Sanded Grout, Terra Cotta, Cantera/Adoquin, Brick ,Limestone, Sandstone, Cement, Slate, Saltillo Tile, Flagstone, Concrete Tile, Pre-Cast Concrete, Flamed & Honed Granite, Honed/Textured Marble, Polished Marble, Polished Granite. ******** 511 Porous Plus is a penetrating sealer designed for the protection of the most porous surfaces. 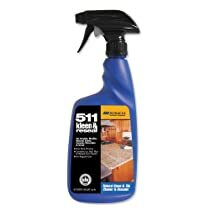 511 Porous Plus forms an invisible barrier that is resistant to moisture and stains while allowing vapor to escape. 511 Porous Plus is not a surface coating and will not alter the natural look. All surfaces are harder and less slippery. INDEPENDENT TESTS SHOW 511 POROUS PLUS OUT PERFORMS COMPETITIVE PRODUCTS. (Test results are available upon request). ******** Coverage: 500 - 2,000 square feet per gallon (72 - 180 square meters per 3.785 liters). 2,000 - 4,000 square feet per gallon (288 - 360 square meters per 3.785 liters) on polished surfaces. Container sizes: Contractor Pack, quart, pint. I have used the 511 Impregnator for about 17 years. This product applies equally as nicely and leaves a similar finish. The finish is invisible once it dries. I used on my Italian, porcelain tile that looks like travertine vein cut. It looks great. I used the 511 Seal and Enhance on my marble and granite. It leaves a beautiful, shiny finish. Some of it was applied to my travertine floors. It really makes them look polished. I applied 2 coats of both of these allowing a 2-3 hour interim dry time. I have not used my shower as of yet, bu the floors look fantastic. I would be careful about waiting too long to wipe the initial application away (3-10 minutes). A powdery white residue will develop. I have used this before and is the best ever! I have used this before and is the best ever!!!! Water just beads up like mercury!!!! It's expensive but a gallon goes a really long way. It's the best I have ever used with no water spots!!!!! I put in a 9ft X 5ft all tile shower and no squeegeing!!!! !